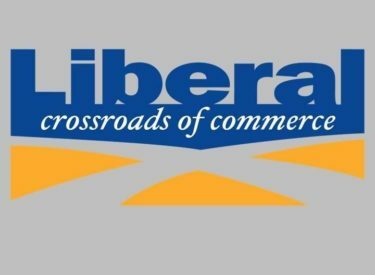 ‏The Liberal City Commission met Tuesday evening and approved the plans to move forward with the stand alone Wastewater Treatment Plant and work with National Beef on aspects of their plans to treat their water. Commissioners also approved Chris Ford, Cal Burke, and Mayor Seigrist to sign documents related to the Revolving Loans, approved City Finsnce Director Chris Ford to seek funding options for the purchase of a new Water Dept building. Costs are estimated at $650,000. For the Golf Course, the Commission approved the new fee structure, and will allow trade ins of golf clubs. Approved for the Fire Dept was the purchase of replacement hose, and also approved was a Memorandum of Understanding with the Kansas Forest Service. Other purchases approved were Panosonic Toughpads for the Building Department, a 1 ton truck for the Water Dept, a dump truck for the Wastewater Treatment Dept, and 2 Ford Interceptors for the Police Dept. Commissioners approved crushing the concrete for the Clay Street intersection project, and an agreement with Earles Engineering for Collector and Arterial Street evaluation. The Commission heard an update on the process to begin the City Manager search, and held discussion on the City’s Charter Ordinance.